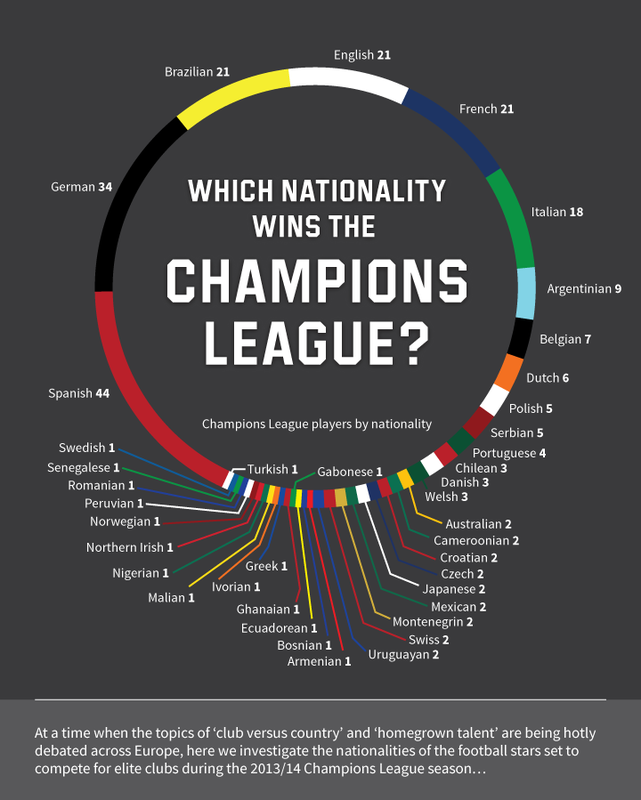 With the 2013/2014 UEFA Champions League approaching, our infographic looks at which countries will have the most players competing for Europe’s richest prize. Spain is top of the list with 44 players involved although they only have 2 teams in the League – Real Madrid and Barcelona. Germany is in second place with 33 players, while England, France and Brazil all have 21 players in the elite squads. Bayern Munich are expected to win the coveted title with odds of 4.25. Barcelona are second choice to win with odds of 4.75, which may seem a little strange given the strength of their team. Fielding a massive 64% of national players, including such famous names as Fabergas, Iniesta, Pique and Puyol this incredible team also contains the Argentine footballer Lionel Messi, thought by many to be the best player in the world today. Messi is the first and only player to score in four consecutive Champions League campaigns, and he also holds the record for the most hat-tricks (4) scored in the history of the competition. In March 2012, Messi made Champions League history by becoming the first player to score five goals in one match. He also matched the record of 14 goals in a single Champions League season. The most international of all the teams is Manchester United, whose line up includes players from 13 countries, as well as 9 English players, so it is hoped David Moyes also has a good team of translators working for him. The players listed in this infographic are based on the A-list squads submitted to UEFA for the group stages of this season’s Champions League. Clubs can choose to bolster these rosters with additional players from their B-list, which is dependent on age and educational circumstances. For further clarification please see article 18 of the UEFA regulations.